The first Riga Latvian Society (RLS) House was built in 1869. 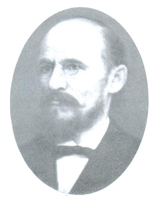 The author of the project was an architect Jānis Frīdrihs Baumanis. In 1897 the building was extended and modified by the architect's Constantine's Pēkšēns’ project. In 1908 this building burned down entirely. RLS at once started to restore the House. The project contest was organized, where the sketches handed the architects E. Laube, E. Pole, M. Nukša, A. Malvess, J. Alksnis, A. Vanags and A. Medlinger. In October 1908 the governor of Vidzeme confirmed architect's E. Laube sketches, however, next April were approved new architects' E. Laube and E.Pole project, after which the building was built. The building works were ended and the House was dedicated in December 1909. The development of a final project was entrusted to E.Laube and E.Pole. Rīgas The Riga Latvian Society House has five floors, but the yard building had six floors. This House was the first building in Riga, built in neoclassical style. Polished granite columns with small lonic capitals were used in portals, and the classical forms’ clarity was seen at the entire composition of the facade with the symmetrical rizalites located on both sides of the main entrance. The generalized layout was of primary importance in the placement of the building rather than refined details or orders’ architectural elements in the facade’s design. All in all, in the architectonic image of the assimetric building’s body reflected also certain Vienna’s Art Nouveau’s formal characteristics. Particularly these were the rizalites’ formation that were crested by domes. Typical Art Nouveau’s elements were also decorative panels that were created by Jānis Rozentāls in the complex colourful cement’s and tile box technique. 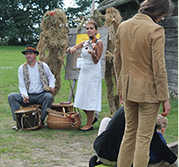 In the central composition were displayed alegorical images from Latvian ancient tales – Thunder, Potrimps and Pikols – which symbolised cultural aims - beauty, strength and wisdom. In their turn, panels on the risalites were displayed to achieve these aims - art, science, agriculture and industry. They were the compositions „The greeting of the Sun” depicted on the left and „At spring” - on the right rizalite. The main hall of the house was the Theatre and Concert Hall on the upper floors of the building with 450 seats in the parterre and 210 seats in the balcony. Beneath it, on the second floor was the Event Hall, as well as a series of other halls used for meetings, offices and public space needs. In the second half of the 20th century’s 30s, when Kārlis Ulmanis bacame the Honorary Member of the RLS, its public life activated, obtaining representing character. Arose need for new premises for meetings and other events. This task was solved in 1935 with an annex, by breaking down the adjacent 4th floors’ building on Merkela Street 15 that belonged to the Society since 1902. The designing of the project was entrusted to the architect E.Laube. The extension of the building was completed in 1938. The outbuilding was succesfully subordinated to the architecture of the main building. On the first floor of the building was the restaurant, but on the upper floors - several club's and banquet halls, from which the most famous were the Ligo Hall on the second and the Gold Hall on the third floor. The indoor decoration had been withheld in classical forms that were very characteristic to E.Laube’s creative style, had been used also separate baroque or etnographic style’s elements. E. Laube himself developed all the drawings for completely all details - banisters, doors, portals, fireplaces, plaster structures, wall and ceiling decorations, light bodies and furniture. E. Laube changed a bit also the old house’s design, combining it with the new part of the same complex. The entrance of the new building was emphasized with a small columns’ gallery and the forged copper door with the images of the Palace of Justice, Riga Cathedral, the Freedom Monument and the Powdeer Tower. All the building interiors have preserved relatively good and authentic. The exception is the partially painted out the Gold Hall’s ceiling and the Ligo Hall’s ceiling’s painting, whose author is E. Treilons. They are intended to be restored. Ernests Pole (1872.-1914.) was born in Birznieki, Lutriķi parish, learned in Saldus, then in Kuldiga, finished the Baltic Teachers' Seminar, in 1901 graduated from Arensburga’s Gymnasium as an external student. From 1901 -1903 he studied agriculture in Jaunaleksandrova’s Agricultural and Forestry Institute, from 1904 -1908 studied architecture in Riga Polytechnic Institute that he finished with a degree in architecture. After E. Pole’s projects were built the fifth General Song Festival’s temporary building, Riga Mutual Loan Company’s house on the corner of Briviba Boulevard and Elizabete’s Street, Riga’s Artisans’ Savings and Loan House on the corner of Kr. Baron’s and Elizabete’s Streets, the house on the corner of Elizabete’s and Colonel’s Briedis’ streets, as well as around 40 high-rise residential houses in Riga. Eižens Laube (1880.-1967.) 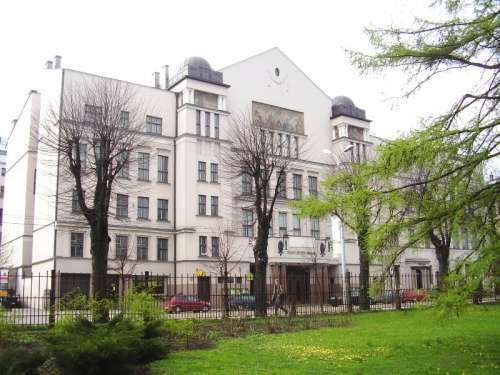 finished Pēteris’ Science bias school in 1889 and in 1906 – Riga Polytechnic Institute’s Architecture department. In 1907 he became the associate profesor of the Institute. In 1919 E.Laube was invited to participate in the establishing of the Architecture’s Faculty at the University of Latvia, in 1920 he was appointed as a Professor of the Architecture’s faculty. From 1919 to 1922 and from 1932 to 1934 he was a Dean of the Faculty. After E.Laube’s projects, until World War I, were built about 80 high-rise buildings - mostly rental houses, as well as a number of public buildings – Traders’ and Industrialists' Loan Company’s House at Brīvība’s Street 33 (1912), Ķeniņš’ School at Tērbata’s Street 15/17 (1905, together with K.Pēkšēns), etc. All of them had been created in the manner of national romanticism or rational upright Art Nouveau forms. During 20s and 30s E. Laube made a number of public buildings’ recovery and reconstruction works. After his projects were built Jelgava’s sugar-refinery, Ķemeri Hotel (1933), 3-Star tower in Riga's Castle (1938), and other buildings. The material has been prepared in cooperation with Prof. Jānis Krastiņš.